The sons of five-time TT sidecar champion Nick Crowe hope to become the "fastest newcomers" at this year's event on the Isle of Man. Ryan Crowe and brother Callum, aged 23 and 20, will take part in both sidecar races, scheduled for 1 and 7 June. 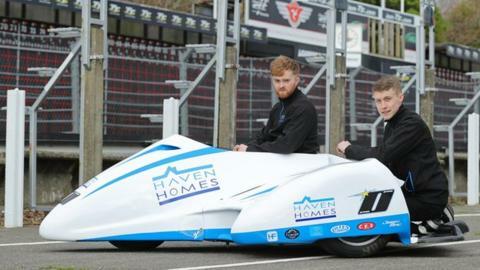 The Jurby pair will compete on Triumph machinery for Haven Homes/HCR Racing on the Mountain Course. Nick Crowe won five TT races between 2005 and 2008 before suffering life-changing injuries in a 2009 crash. Driver Ryan Crowe said it was "appropriate" that, a decade after their father last raced at the TT, with partner Mark Cox, they would be taking part in the event. "With Dad being both a former driver and passenger, he's in quite a unique position, so has been able to give the two of us a lot of advice and although the Triumph isn't a widely used machine, the engine's very strong and has run faultlessly last year so we can't wait," he said. The prospect of racing at the TT for the first time was "nerve-wracking," passenger Callum admitted. "I've been getting plenty of advice off my Dad in terms of where to be on the outfit and how it will feel like," he said. The brothers have competed in sidecar events throughout Europe and the UK for the past two seasons and will race in this year's F1 British Sidecar Championship prior to the TT, which takes place between 25 May and 7 June.